I have a Beauty Wishlist where I write down all the makeup products that I want to try out. I keep the long list of them in the notes section on my phone. 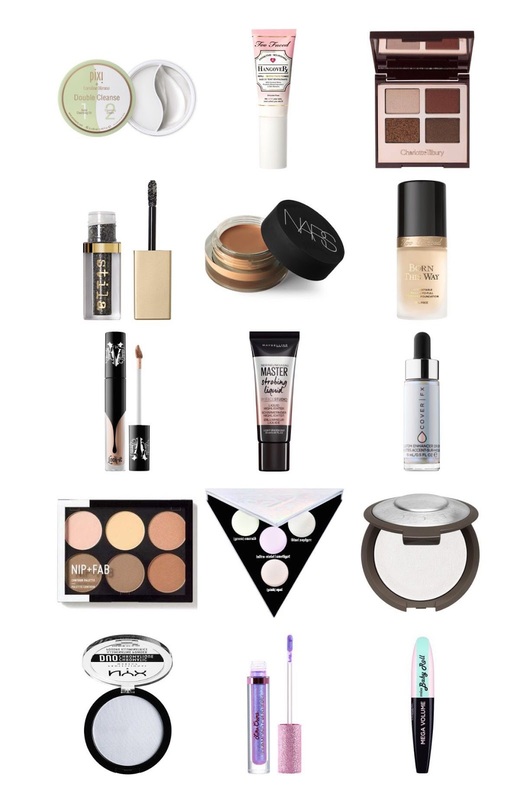 I thought I would share with you some of the makeup bits that I am keen on buying and trying out. Leave a comment on the products that are on your Beauty Wishlists atm! After trying out the Pixi Glow Tonic and loving it, link to the post I wrote on it here, I want to try out some more skincare products out from Pixi. I've heard great things about the Pixi + Caroline Hirons Double Cleanse, one side is a cleansing oil and the other is a cleansing creme. This sounds great for getting all makeup off from your face and making sure face is properly cleaned too. The Too Faced Hangover Primer is supposed to be amazing for us dry skin girls. I prefer more of a Silicone based primer usually but i'm interested to see if this will help my makeup look better when my skin is very dry. The Charlotte Tilbury Dolce Vita Quad is full of gorgeous shades, I especially like the top right eyeshadow which is a reddish brown colour. Have you seen swatches of the Stila Magnificent Metals Glitter & Glow Liquid Eye Shadows? They look insanely pigmented and look so cool on the eyes. They look like an easy way to wear glitter without having to go through the hassle of putting on glitter glue. In summer I like using a pot concealer and my fave one to use is the Mac Studio Finish concealer. The Nars Soft Matte Complete Concealer looks like it has good coverage and I want to see how it will compare to the Mac one. I've been on the hunt for a foundation that is more suited to my skin type, the Too Faced Born This Way Foundation is apparently great for dry skin. It has a medium to full coverage which is what I look for in foundations. I want to pick up the Kat Von D Lock It Concealer in White Out. I'm quite pale and it would be handy to have a white concealer to mix with my normal concealers so I can create really bright under eyes. Next up on my Beauty Wishlist is the Maybelline Master Strobing Liquid Illuminating Highlighter in Light. I'm slowly getting into using cream products on my cheeks and this illuminator looks like it would give a great glow perfect for the warmer months that are coming. The Custom FX Enhancer Drops in Halo have been on my Beauty Wishlist for so long now! The swatches i've seen of this holographic illuminator look stunning! I'm really glad that Nip + Fab have started selling makeup products now. There are so many of their products that I want to try out including this Contour palette in Light. It has got a lot of similar shades as the Anastasia Beverly Hills contour kit. The packaging of the Kat Von D Alchemist Palette is so eye catching and I like how these holographic highlighters can be layered over eyeshadows and lipsticks too. I know everyone raves about Becca's Champagne Pop but I think the one in Pearl, which is white, will suit my pale complexion better. 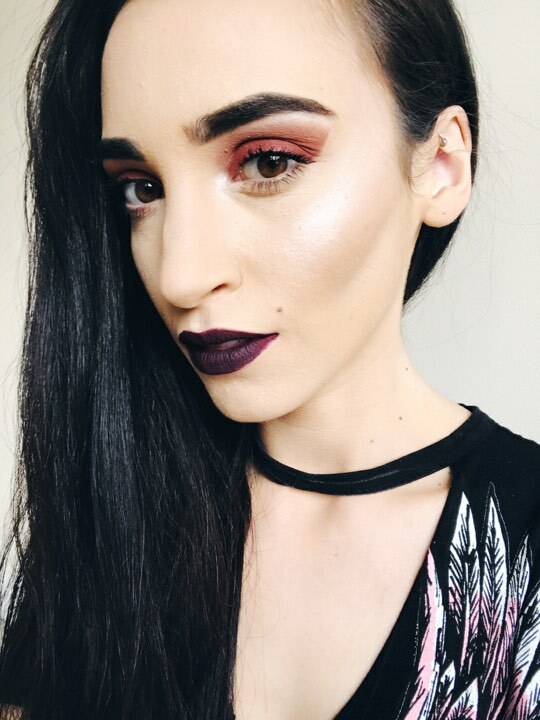 Okay so I know by now you're probably sick of me talking about highlighters in this post but i've been loving testing out highlighters recently. The last one i'm going to talk about is the Nyx Duo Chromatic Illuminating powder in Twilight Tint. Blue is my fave coloured highlighter that i've tried out and I think it really suits people with fair skin. For lips, I really want to try out the Lime Crime Diamond Crushers. They are Iridescent Lip Toppers which can completely transform normal lipsticks to a glittery holographic lip. The shade I really like the look of is Trip which is a stunning bluey glitter. I think you could create some really fun looks with these lip toppers. Last thing on my wishlist is the L'Oreal Miss Baby Roll Mascara. The wand on this looks super interesting, it has a mega curl roller brush that is supposed to give a lot of volume to lashes and keep them curled. I really wanted to try that Nyx Duo Illuminating Powder! I also want to gain more Benefit Cosmetics into my makeup collection. Great favorites! This is such a great wishlist! I particularly like the thought of trying Pixi Double Cleanse!